The program development team at Connecticut Branches has spent years researching and developing a program philosophy that is different and innovative. We believe that all children, teens, and adults have an interest and desire to learn. 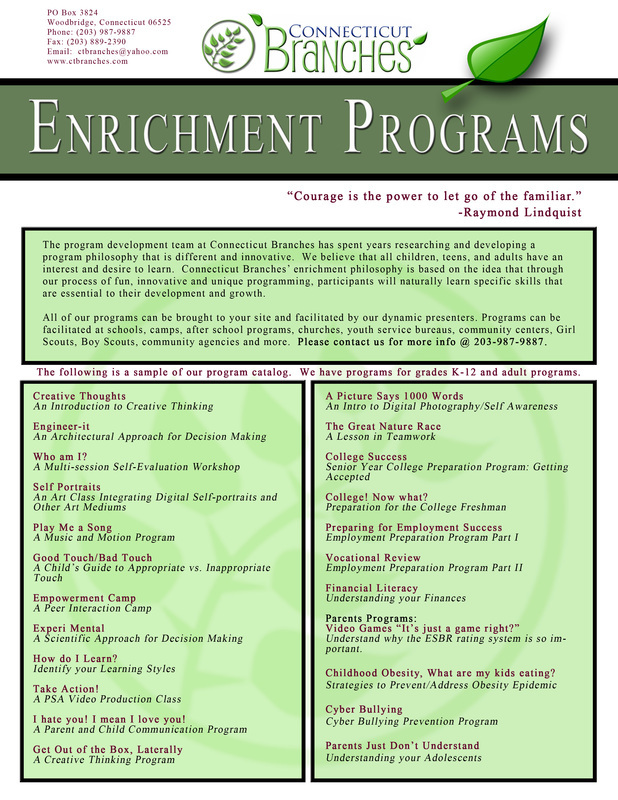 Connecticut Branches’ enrichment philosophy is based on the idea that through our process of fun, innovative and unique programming, participants will naturally learn specific skills that are essential to their development and growth. All of our programs can be brought to your site and facilitated by our dynamic presenters. Programs can be facilitated at schools, camps, after school programs, churches, youth service bureaus, community centers, Girl Scouts, Boy Scouts, community agencies and more. Please contact us for more info @ 203-987-3968. *All programs and philosophy are the intellectual property of Connecticut Branches, Copyright 2012.